For the Ultimate Vacation with (or without) your Horse! 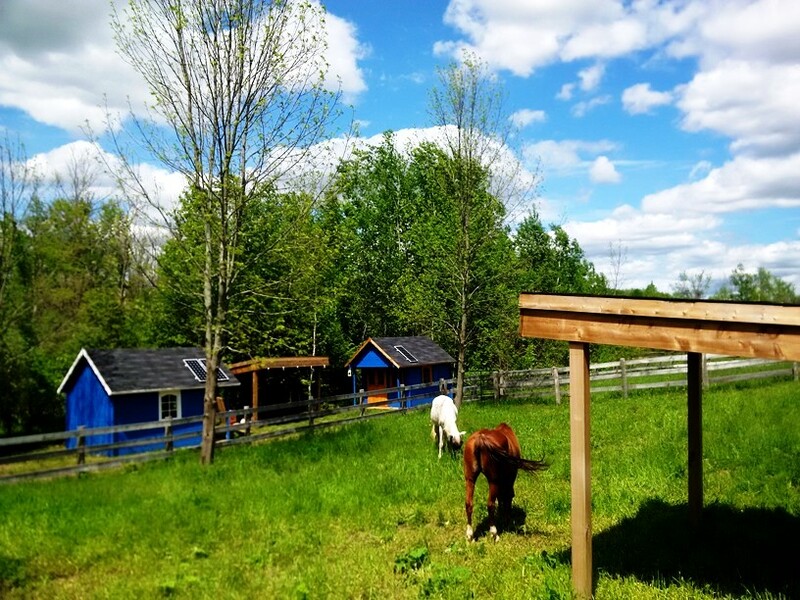 A unique vacation with your horse in Ontario at LoFoSo Farm Bed and Bale, 1 hr. 15 min. North of Toronto; 25 min. West of Barrie and 25 min. South of Wasaga Beach. for You and Your Horse? Does a Bed, Breakfast and Bale getaway in a cozy cabin appeal to you? LoFoSo Farm owners Mila Bon and Jeff Lambert know from experience the pressures of a hectic life and are able to offer a unique vacation experience for horse owners and their horses. When you're here you're family and we will make sure that your stay with us will be such a relaxing experience that you will not want to leave! Scroll down to see what we have to offer! Located near beautiful Glencairn, only 25 minutes West of Barrie and less than 75 min. NW of Toronto (GTA). LoFoSo™ Farm is surrounded by 11 county forests, all within 1.5 - 10 km from the farm, including renowned Dufferin Forest Main Tract! 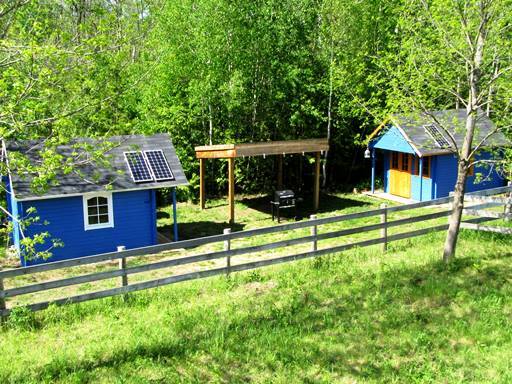 LoFoSo Farm offers storybook cabins in a tranquil setting with private paddocks for your horse(s). Lodging in storybook cabin, 1 hr. 15 min. North of Toronto, Canada. Every cabin sleeps up to 3 people comfortably and has its own private grass paddock with shelter (approximately 90x60 ft). 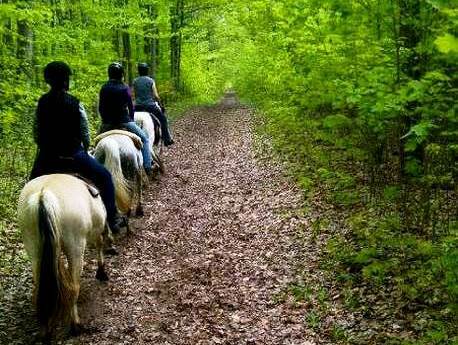 Bring your horse and your best horsie friend(s) and come to relax, ride miles of trails, enjoy wildlife and peace & quiet. Wake up to a country breakfast served right to your door, mostly home grown and pasture raised. No GMO, no pesticides, no antibiotics! Bacon like you have never tasted before from our own pasture raised heritage pigs, fresh eggs and fresh garden vegetables. Got sore muscles after your ride? Enjoy our head-to-toe massage chair! Take a book from our extensive equine library for some educational reading and more relaxation. Then fire up the bbq to grill some of our farm fresh products. Pricing for Horse Vacation at LoFoSo Farm, 1 hr. 15 min. North of Toronto, Canada. Pricing for overnight stay is per person and includes your stay in one of our cabins (based on double or triple occupancy), a private paddock (per cabin) and hay for your horse as well as your choice of any of our delicious breakfast options, delivered to your door. Lunch and BBQ packages available upon request (additional charge). Coffee, Tea, home made Ice Tea and Cold Water are free at any time! Use of our round pen and outdoor ring. Also available are: 4 piece guest bathroom in farm house, (Luxury Swedish composting toilet at cabin, no smell!) equine library, full body massage chair. Horse Vacation trails near LoFoSo Farm, 25 min. West of Barrie. The beautiful trails surrounding this property are unsurpassed with forests, hills and water features to make your trail rides as challenging or as relaxing as you wish. Ride right off the property and get your horse's feet wet in the creek bed, take a short ride out to Modrits tract, or a 3-10 min. trailer ride to any of the other 10 county forests surrounding the property. 11 County Forests are surrounding LoFoSo Farm, all within 10 km. The furthest away is the main entry to Dufferin Forest, a 10 minute trailer ride! Trailering available (2 horse gooseneck) for FREE to any of the surrounding 11 county forests at any time!